Location(s): Outdoor area (no courtyards). Beach, Park, Lawn, Alleyway, Loading Dock, or top of a Parking Structure are all great spots. 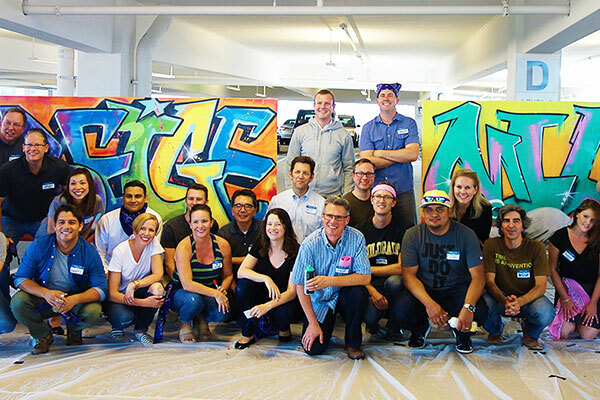 Let your team experience the power of identity and branding through the creativity of Graffiti Art. Vision, message, and branding focus prominently in this even. You can use graffiti to start conversations on big picture thinking, innovation, creativity, and breaking out of silos. The finished piece makes beautiful art and a powerful reminder of the days lessons that you can hang in your office. World Class Graffiti Artist, Professional Emcee To Keep Everyone Hyped, Experienced Team Facilitators, Individual Team Canvasses, Specialty Spray Paint, Graffiti Reference Materials, Protective Gear, Team Bandannas, Custom Engraved Medals For Winners, Bottled Water, Sunscreen, 2 Tables, Shade Canopy And A CRAZY Good Time. Is it messy? Will I get paint on me? Not at all. The biggest culprit of paint on clothing is inadvertently brushing against one of the painted surfaces. Just be careful when you take your selfies. We provide gloves, masks and aprons. Will paint get on the ground in our [parking lot, courtyard, lawn, patio]? 99.9% of the time you won’t see any paint on the drop cloths we put down to protect the ground. We also have ninjas that catch all paint droplets before they hit the ground. True story. There are options but most likely you will be painting on canvas. However there are options for wood, cardboard, and permanent wall space.